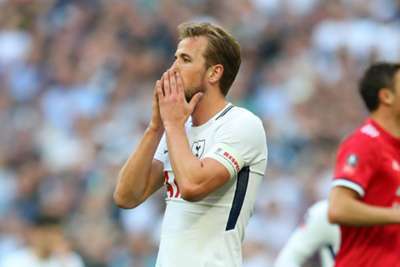 Harry Kane believes the frustration from Tottenham's 2-1 FA Cup semi-final loss against Manchester United at Wembley will linger for the remainder of the season. United endured wave after wave of Tottenham attacks during the opening stages and Dele Alli slid in from close range to give the Londoners the lead from Christian Eriksen's 11th-minute cross. Paul Pogba struggled early on, but muscled Mousa Dembele to the turf to send in a sumptuous ball after 24 minutes for Alexis Sanchez to head an eighth goal in as many Wembley appearances. Kane and Alli came close before the equaliser and Eric Dier's deflected drive struck the post in first-half stoppage time, making Ander Herrera's 62nd-minute winner and Spurs' subsequent lack of a late rally tough to take. "I'm as disappointed as the whole team are, the whole club are. It wasn't our day so it's frustrating," the England striker said. "Picking ourselves up for the Premier League is all we can do. There are four games left and that's the only thing to play for, to finish in that top four and it's important that we do. "This one hurts and it will do for the rest of the season but we've still got a job to do." 42 - We've responded well since United's equaliser and continue to look dangerous. No clear-cut chances for either side since Sanchez's leveller though. Aside from almost getting on the end of Son Heung-min's searching ball to the back post at 1-0, Kane endured a similarly barren outing in front of goal to the one he experienced seven days ago in the 3-1 loss against Manchester City. "We've had tough games. Man City was a tough one, frustrating," said the 24-year-old, who returned ahead of schedule from an ankle injury earlier this month. "I feel good, I feel sharp. Sometimes as a striker you go through spells. I've still scored two goals in four games. It's not terrible form. "But it's frustrating because in these big games, as a striker, you want to score goals and help the team but it wasn't to be." Following last season's loss at this stage of the competition to Chelsea and the Champions League last-16 defeat to Juventus, Mauricio Pochettino's side again had nothing to show for their efforts in a high-profile knockout tie where they had significant periods in the ascendancy. "It's hard say why," Kane added. "We started well, we went in front and then conceded a sloppy goal. "At 1-1 no one created clear-cut chances. They took a half-chance and went 2-1 up and we struggled to break them down after that. "It was very similar to Juventus. We were on top for periods of the game. Today was a bit more even than Juventus. "We just couldn't get the second goal. They did and they went on to win."